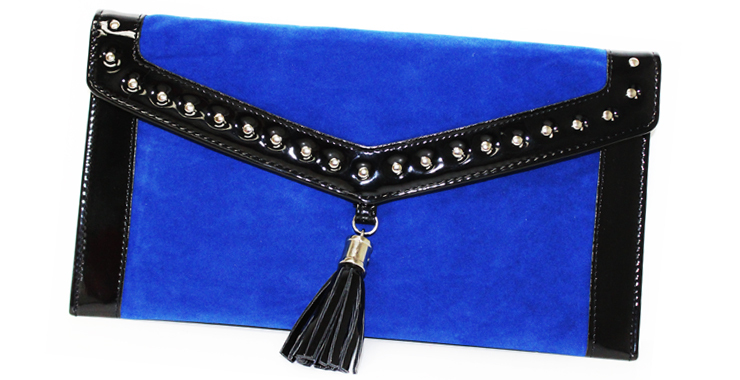 Faux suede studded clutch with contrasting trim, interior pocket, magnetic snap closure. Silver studs and tassel detailing adds some edge to this classic clutch. The clutch used to be the ultimate evening go-to-bag, over the years the clutch has gained popularity as a day bag. Clutches are versatile and can be worn in many ways, it all depends on your personal style. If you like to play it safe match the clutch with your outfit. Not afraid to take risks? Make a statement by purposely mismatching the clutch to your outfit.